This is the gravestone of the unmarried daughter of Henry and Hannah (Mason) GALLUP. She was born on 29 Dec 1764 in Groton, CT and died at the age of 61 on 14 Oct 1824. 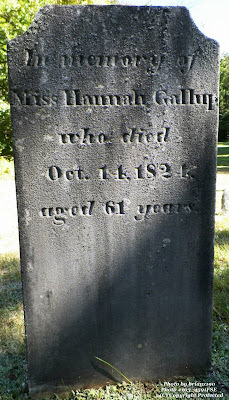 The current Gallup (2009) genealogy doesn't tell us where she died, just that she is buried in this graveyard. The Connecticut death index for Ledyard lists her as living in Ledyard when she died. All we have is the 1800 census which lists several Gallup men on right after another. Henry Gallup, Jr. is listed as a separate family from his father. Miss Hannah GALLUP was 43 when her mother died and 46 when her father died. It is probable that she lived alone or went to live with a sibling or one of her siblings (and their family) continued to live in the family homestead and Hannah lived there until 1824 when she died.